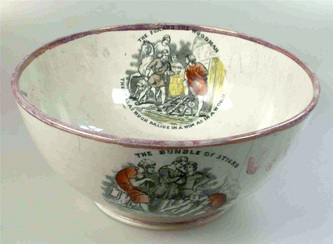 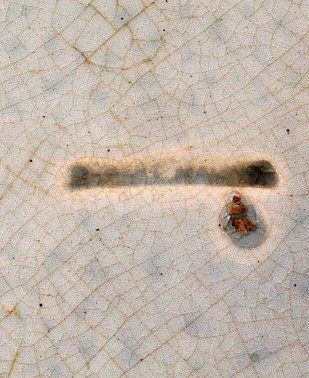 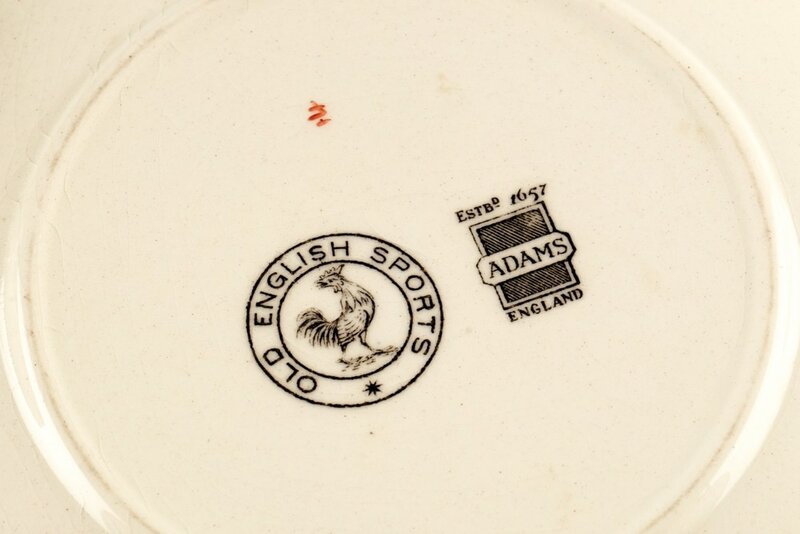 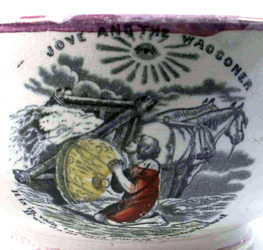 The bowl above shows some of the other transfers in the series, which might yet be found on plaques. 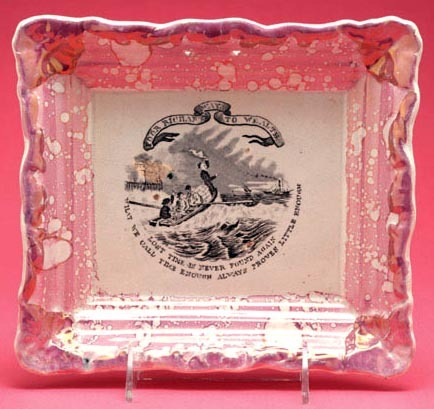 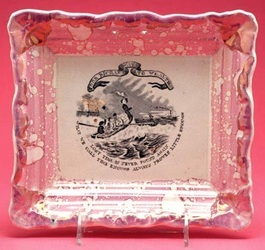 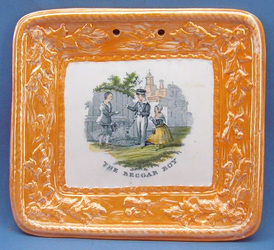 Staffordshire plaques, c1830. 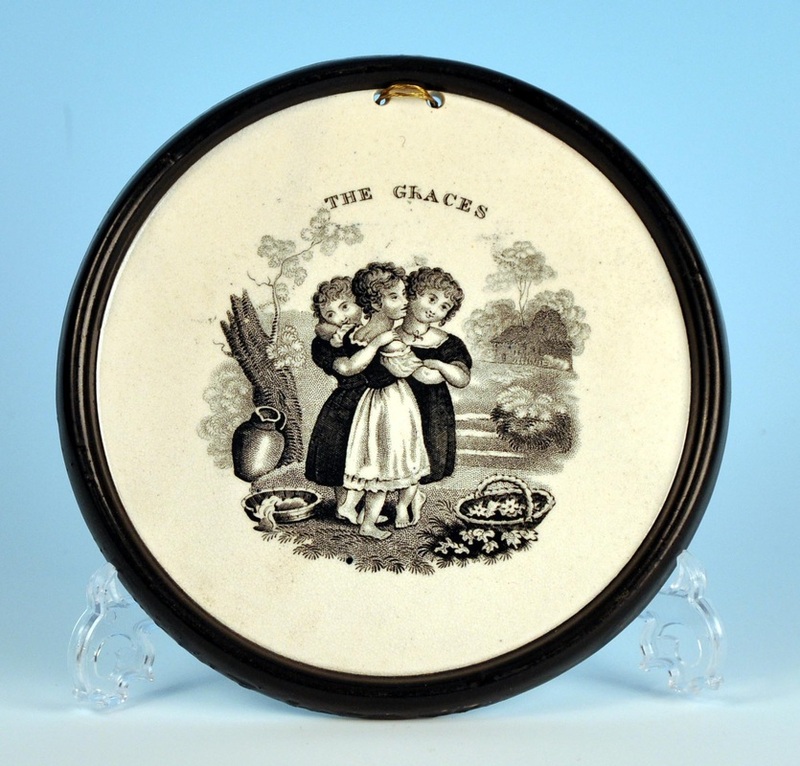 The first rectangular plaques is 5.5" x 4.5", the circular plaque is 6" diameter, the second rectangular is 4.25" x 4.75", and the last two plaques are larger, 8.5" x 6.75". 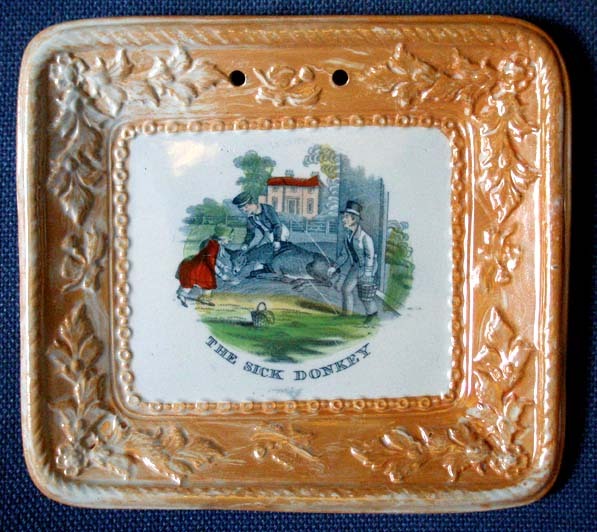 Read more about these plaque forms here. 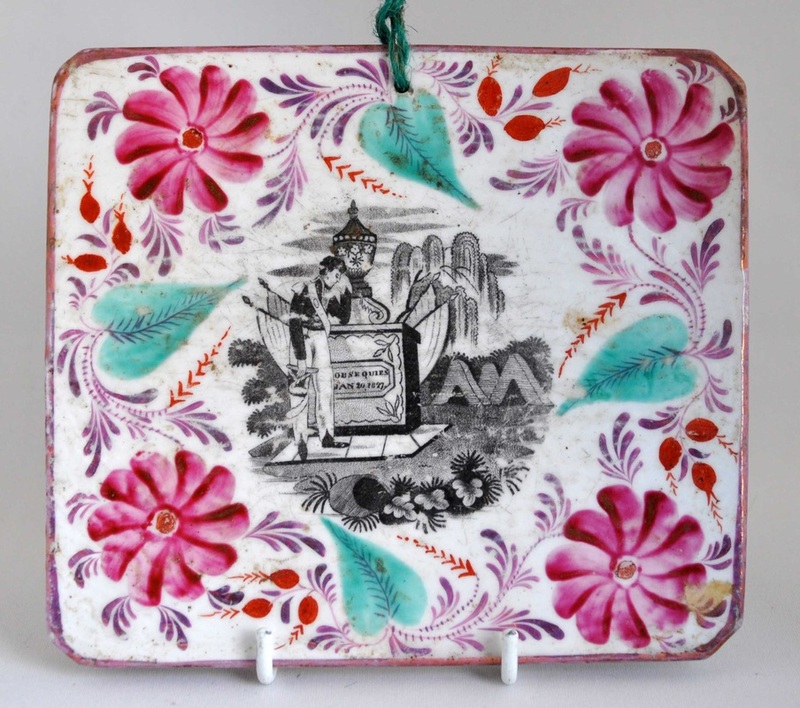 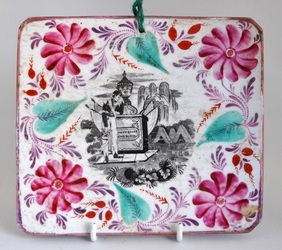 This plaque, although unmarked, is attributed to Adams Pottery in Staffordshire, and was made in the first half of the 20th century. 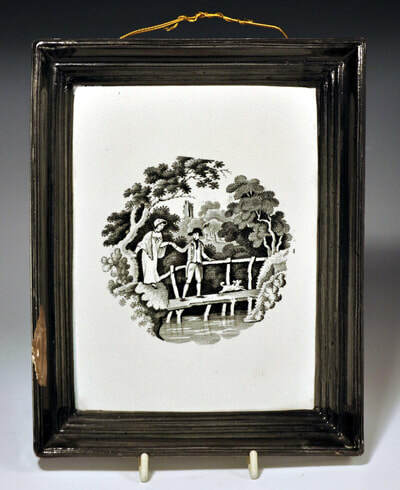 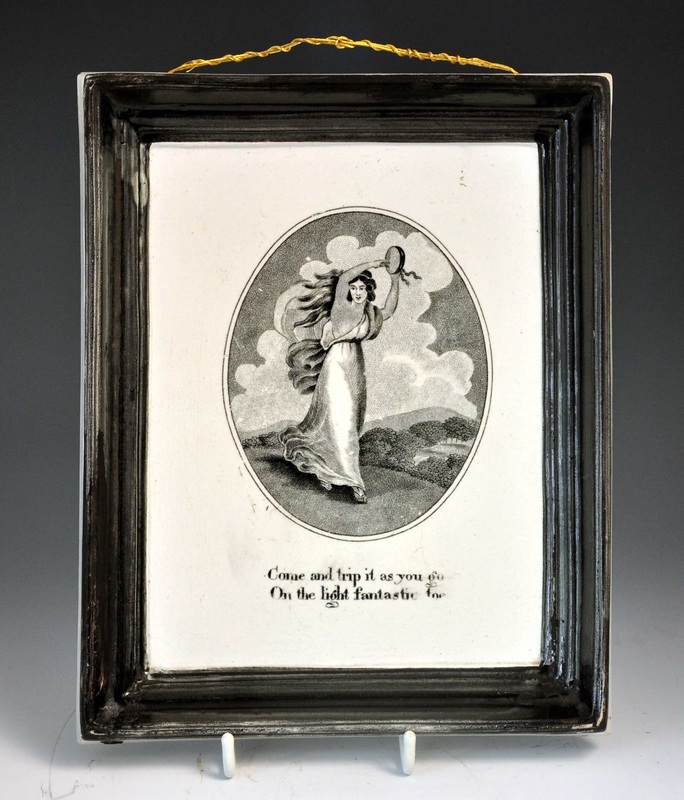 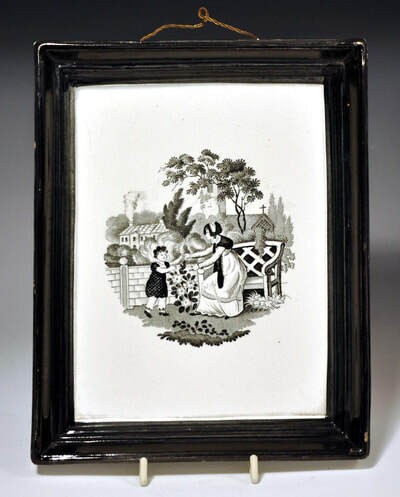 The transfer is after a print by Henry Alken, and only very rarely appears on plaques. 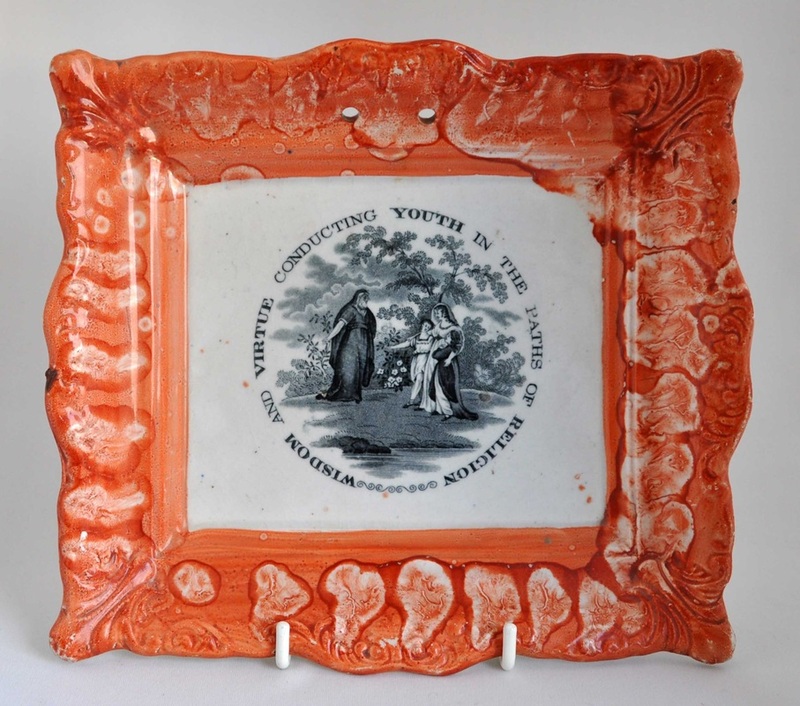 Despite being a 'reproduction' of an earlier Sunderland plaque, it would likely be desirable to collectors because of its rarity. After an etching and aquatint by Thomas Rowlandson (top right) showing the death of Punch, Dr Syntax's horse. 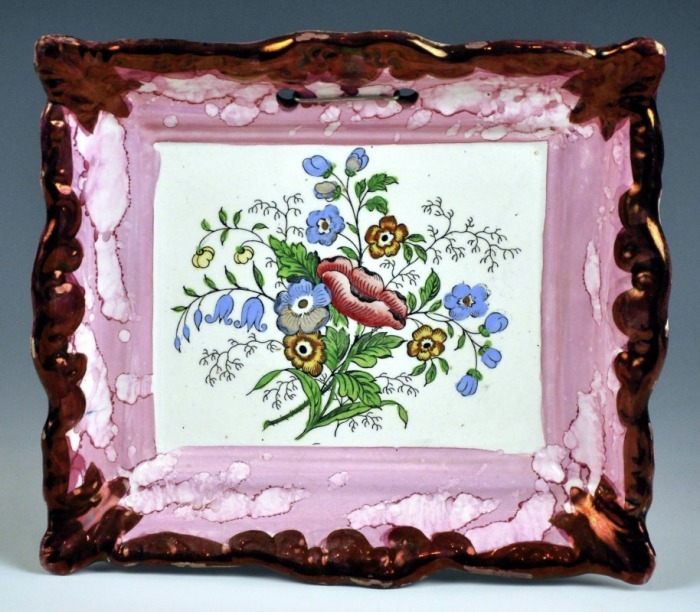 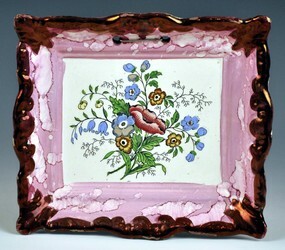 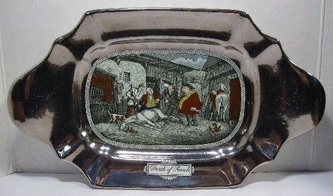 The plaque, although unmarked, is attributed to Adams Pottery in Staffordshire, and was made in the first half of the 20th century. The silver lustre platter (below left) has a 20th century Adams' printed mark (below centre). The last photo shows another transfer from the Dr Syntax series. Ian Sharp has identified the mark as the Tyneside company J Burn & Co from the Stepney Bank Pottery, Ouseburn, 1852–1860. The above plaque (left) is unmarked. 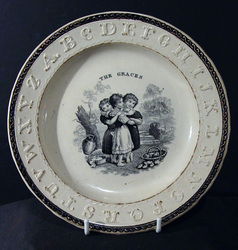 The alphabet plate (right) has a slightly different transfer. A similar plate came up on eBay with the impressed mark T.& B. GODWIN. 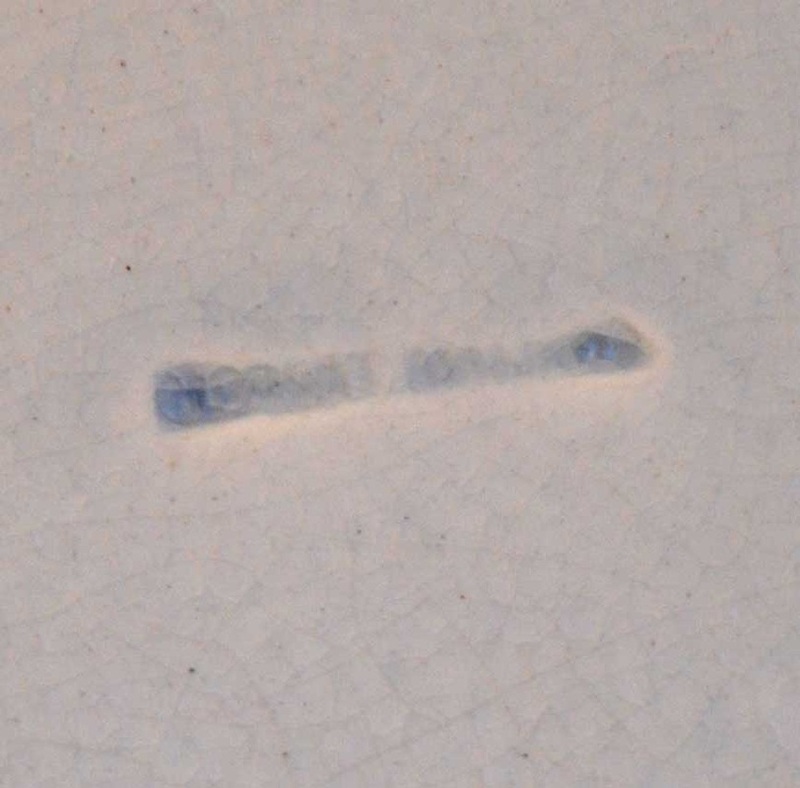 NEW WHARF. 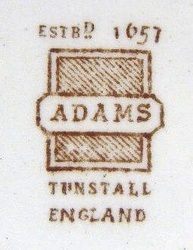 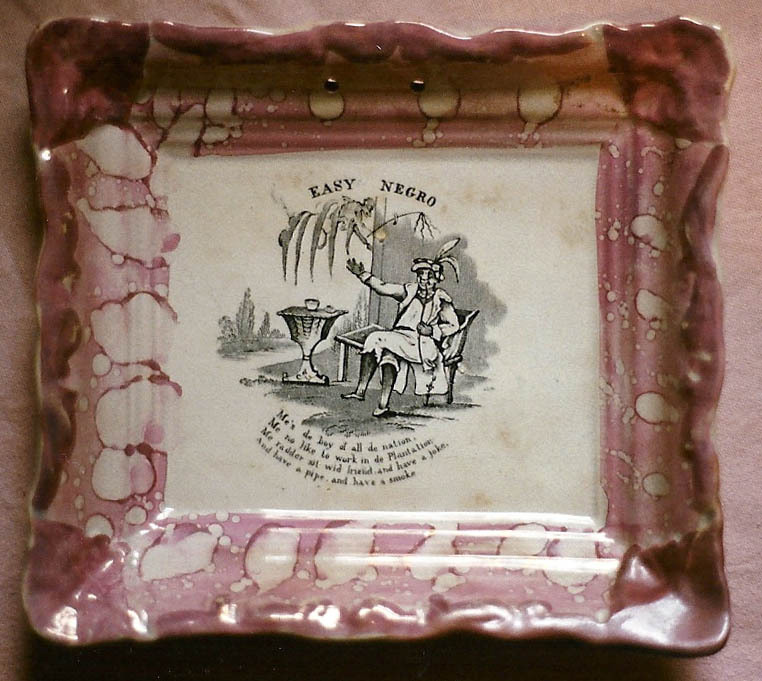 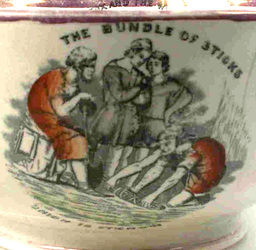 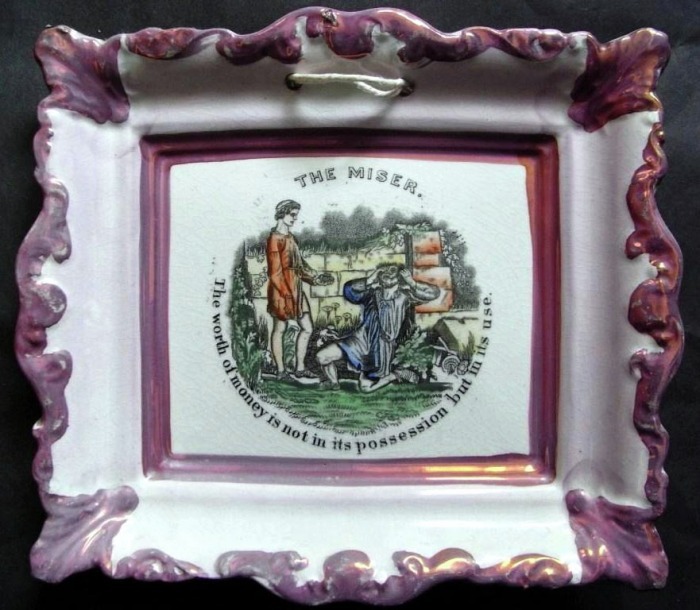 (New Basin Potteries, Burslem, Staffordshire 1809-1834). 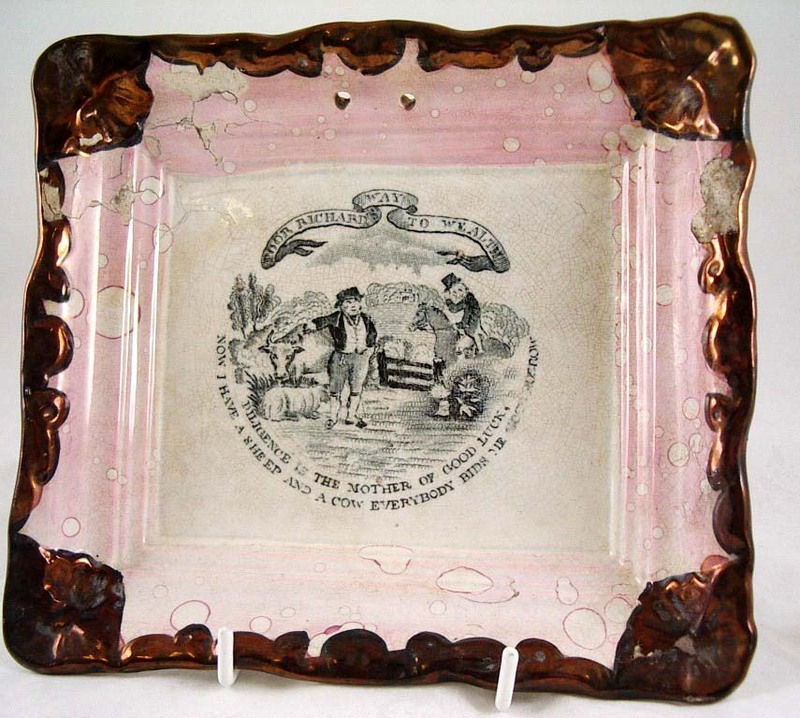 The plaque is likely also Staffordshire. 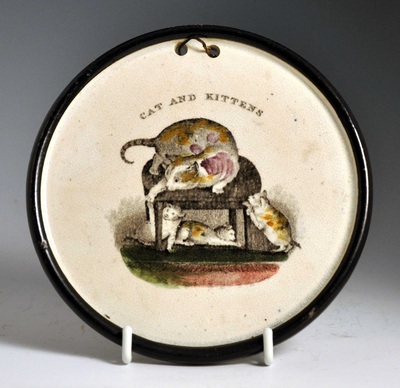 A hand-coloured plaque titled 'CAT AND KITTENS' (left) and (right) a similar plaque titled 'CHRISTMAS DAY'. 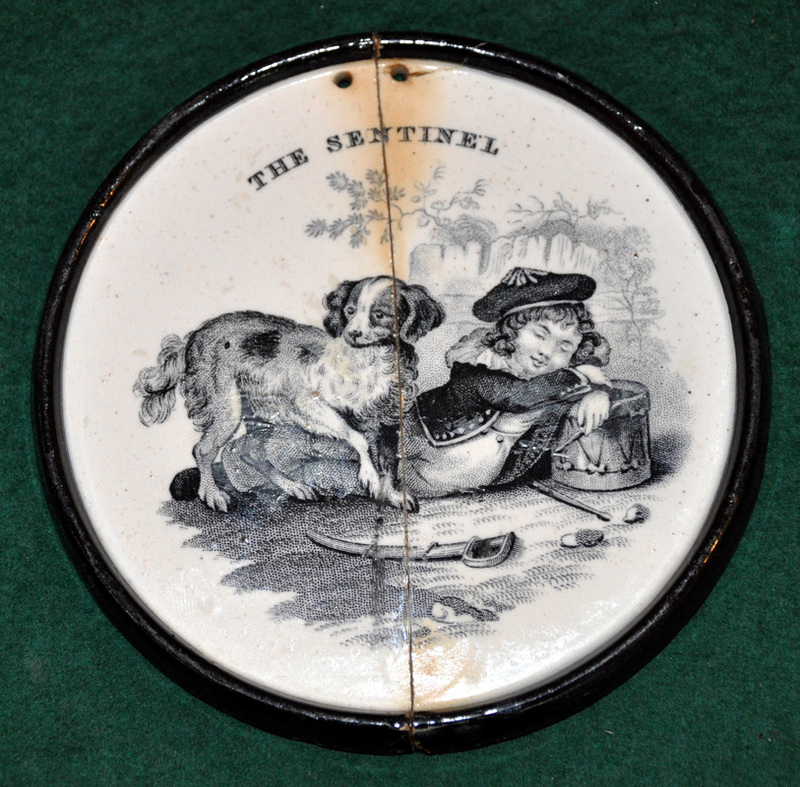 Between them is an unusually small, plaque titled 'THE SENTINEL'. Page 199 (757) of Riley (Gifts for Good Children) shows a similar alphabet plate to 'THE SENTINEL' with the impressed mark T.& B. GODWIN. NEW WHARF. (New Basin Potteries, Burslem, Staffordshire 1809-1834). 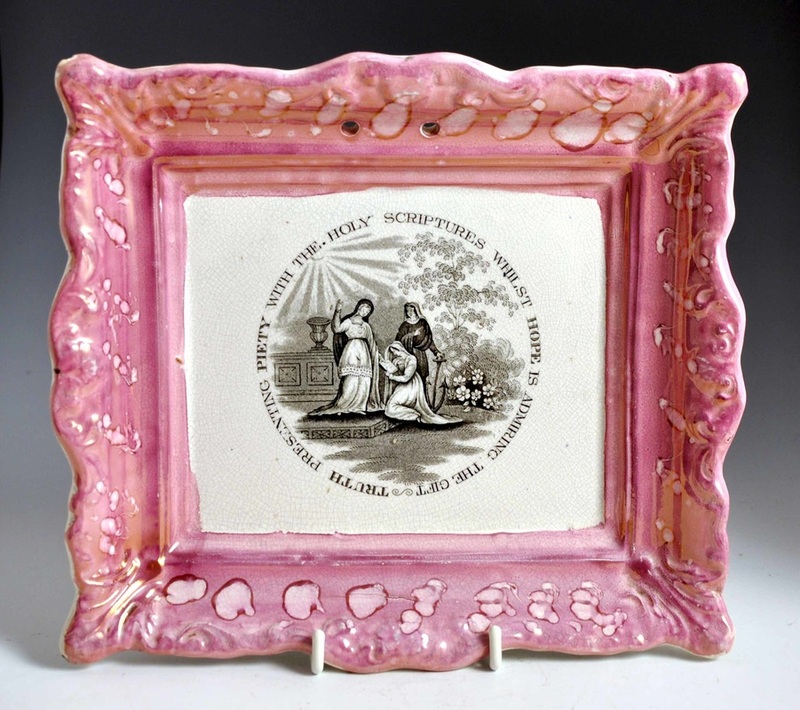 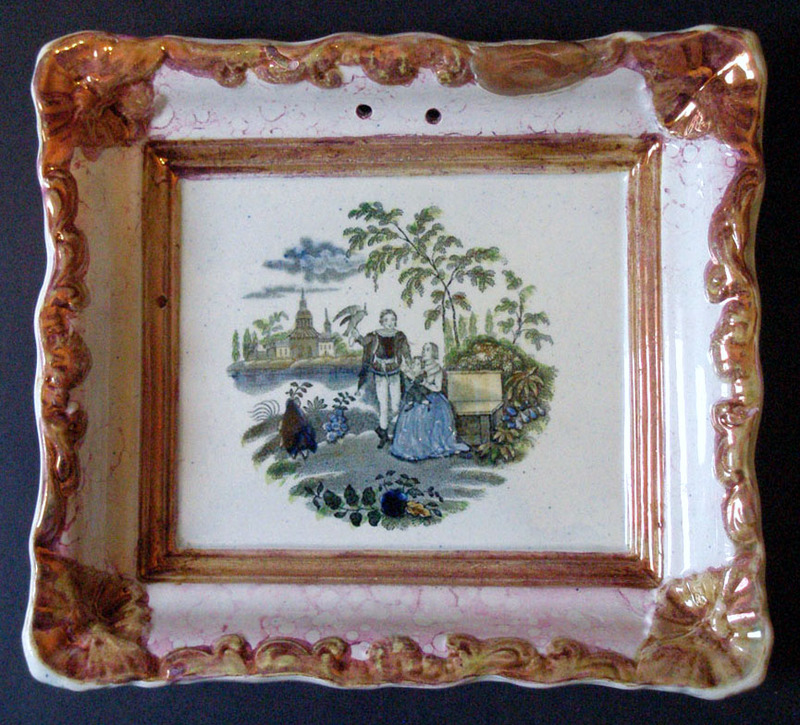 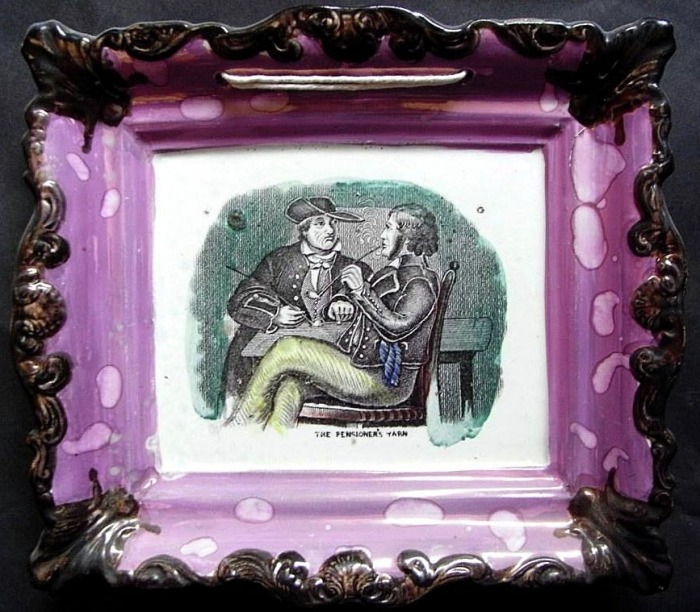 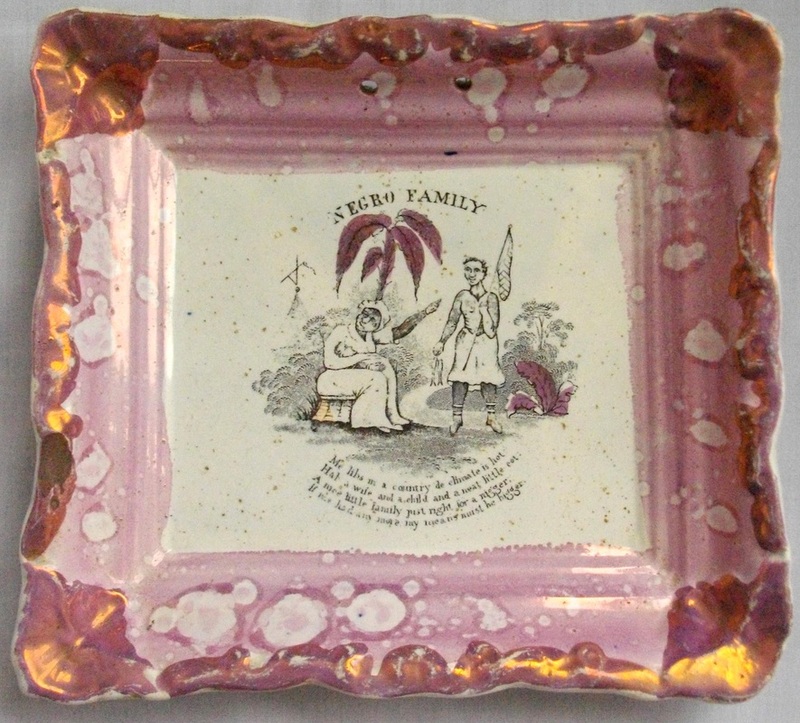 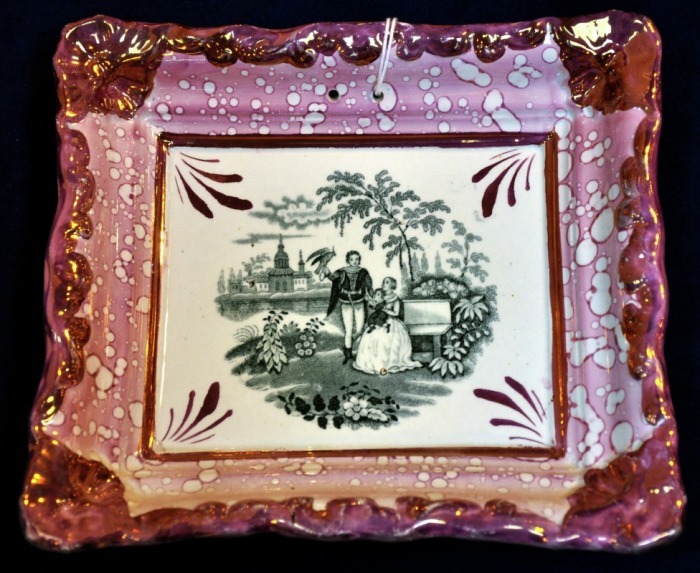 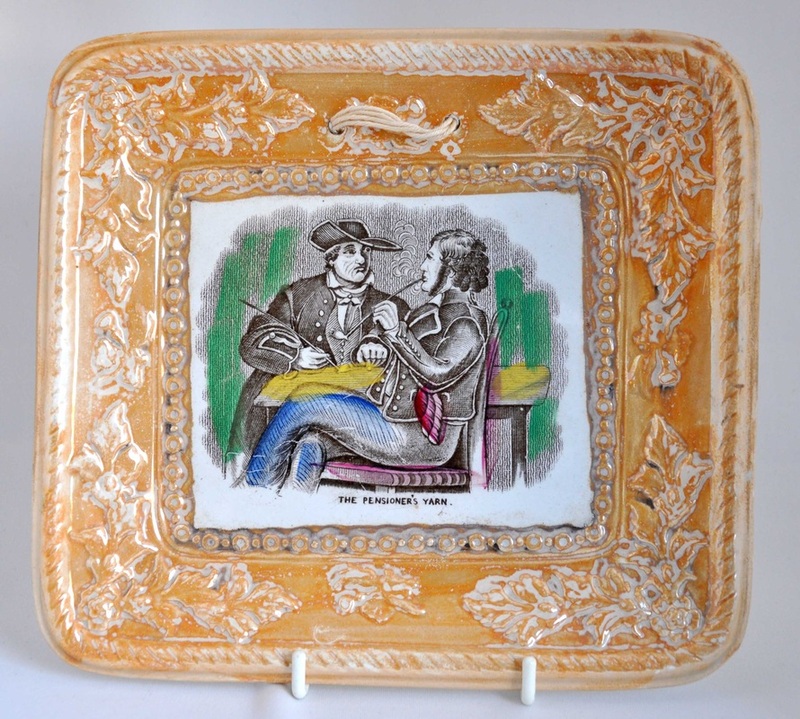 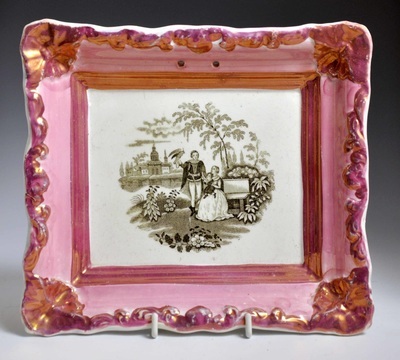 Page 37 of Gibson (19th Century Lustreware, 2000) shows another similar plaque with two girls. 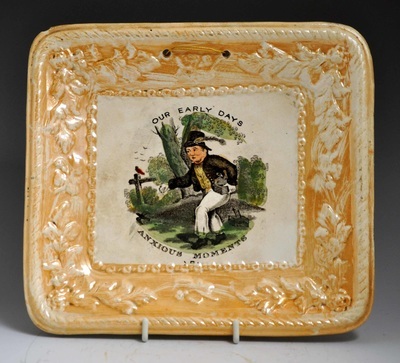 The plaque has the impressed mark 'C. 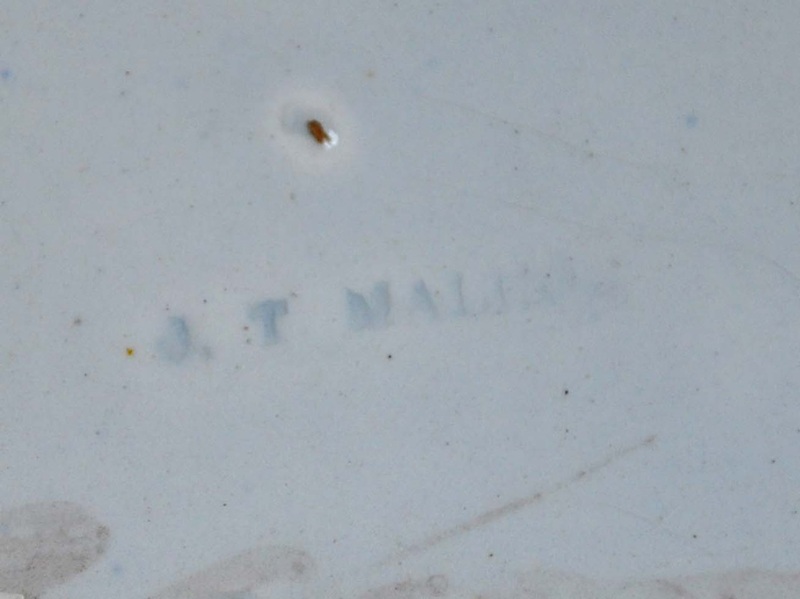 T. MALING', shown in the photo below it. This would date it post 1853. 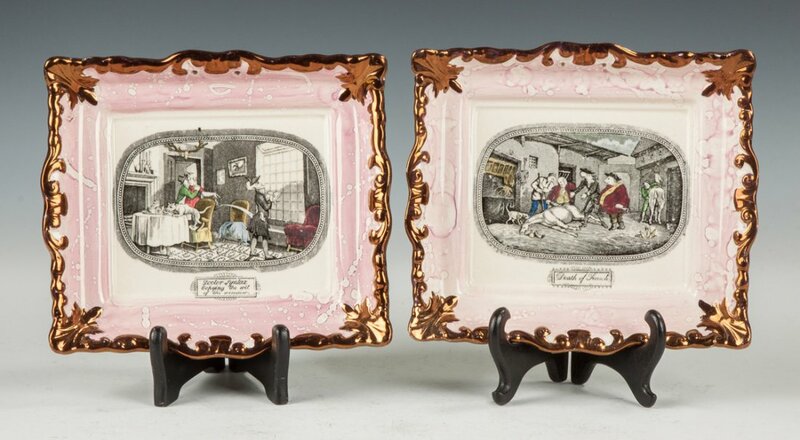 These plaques are smaller than the Moore & Co plaques with similar scalloped corners. 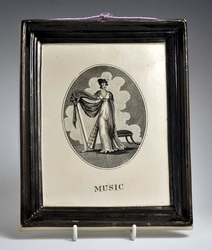 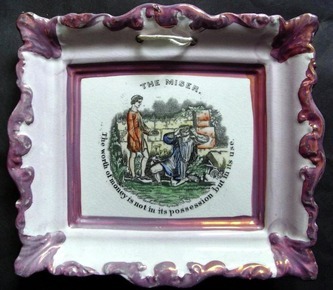 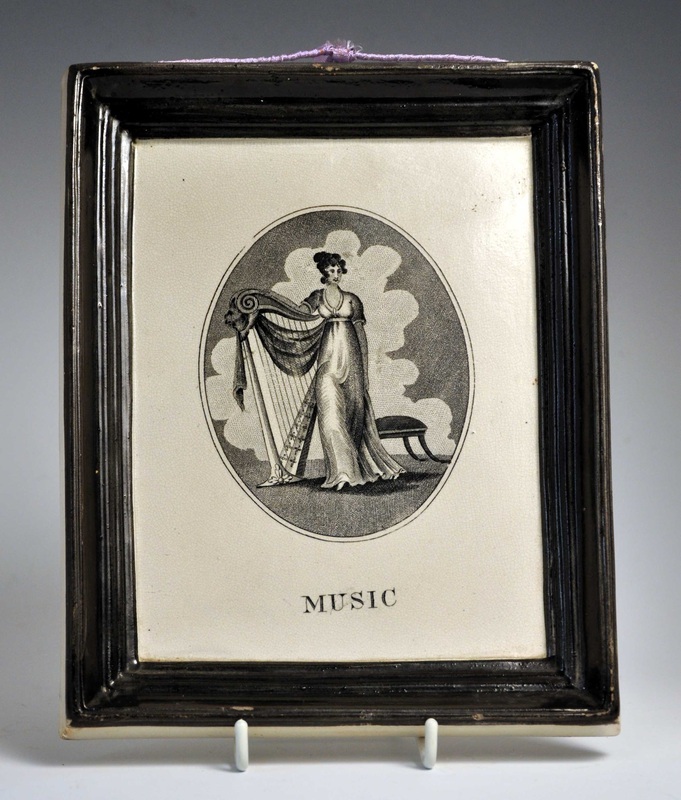 A Staffordshire plaque depicting 'MUSIC'. 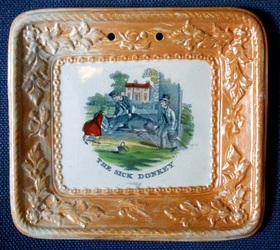 Read more about this plaque form here. Another similar with verse from Milton 'Come and trip it as you go, on the light fantastic toe'. 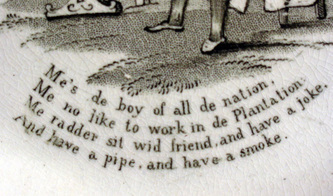 The language on this plaque, shocking by today's standards, stands in stark contrast to the solemnity of anti-slavery wares, with their slogan 'Am I not a man and a brother?'. 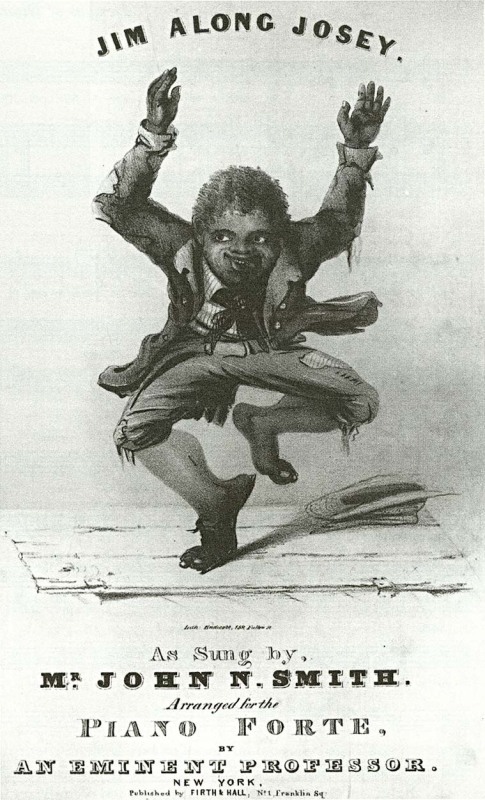 (Britain's anti-slavery stance, for the abolitionists, was a source of patriotic pride. 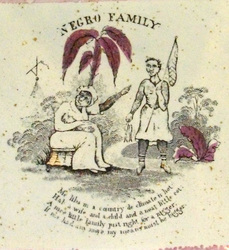 Early black figures were sometimes clothed in the red, white and blue of the British flag. 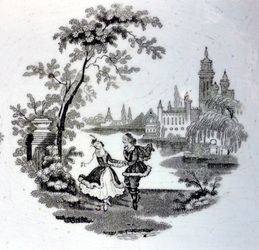 See one such figure at the bottom of Myrna Schkolne's figures page.) 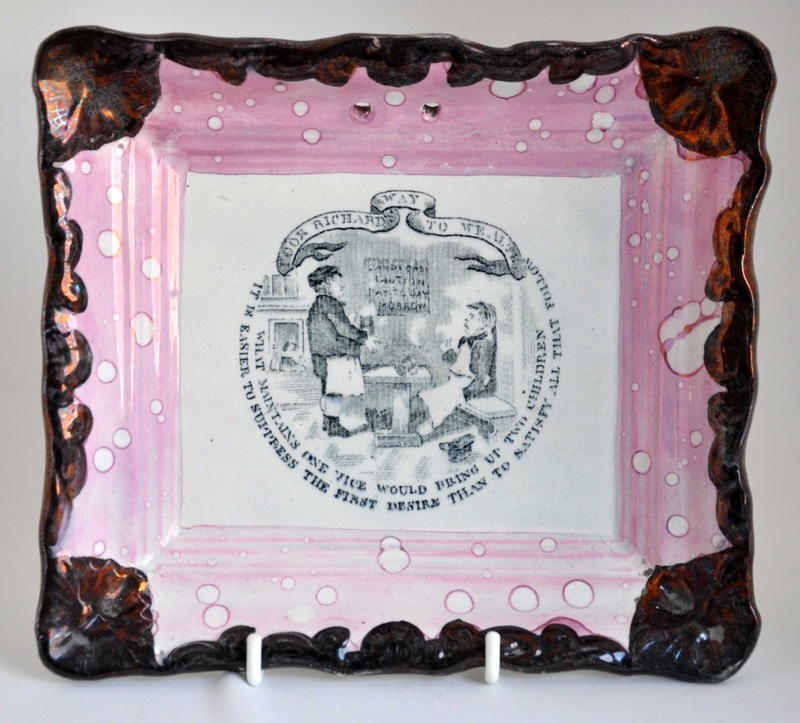 The plaque above relates to the minstrel shows of those like T D Rice, white men with burnt-cork-blackened faces who parodied black speech and characteristics. 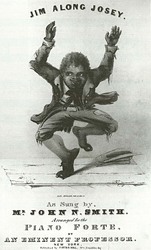 The most famous incarnation being Jim Crow. "Jim Along" was probably the equivalent of the phrase "Get a-long", which Harper employs in the chorus of this song "Hey, get a-long, get a-long, Josey". 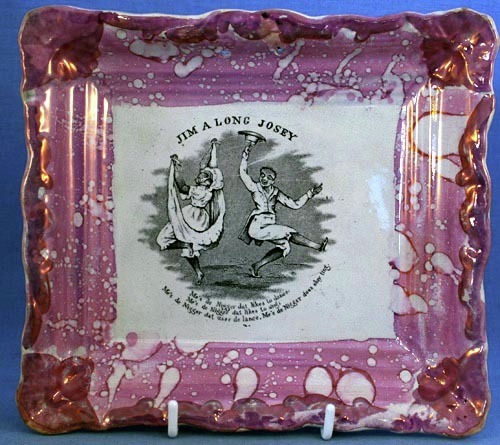 Hey, get a-long, Jim a-long, Jo! 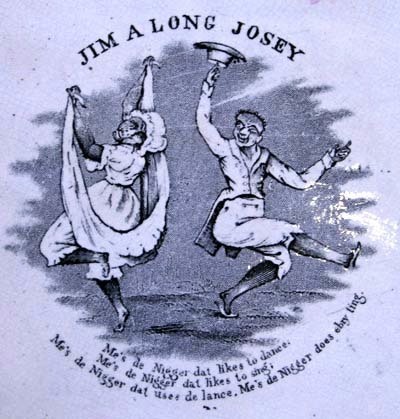 Hey, get a-long, get a-long Josey, Hey, get a-long, Jim a-long Jo! 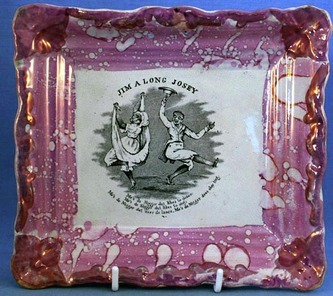 These plaques belong to the same series as Jim A Long Josey above. 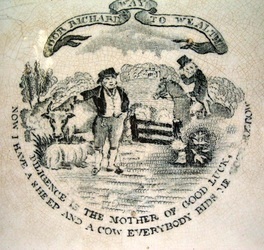 The plaques have the impressed mark 'C. 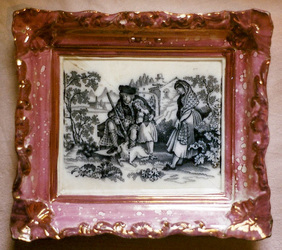 T. MALING', shown below right. This would date them as post 1853. 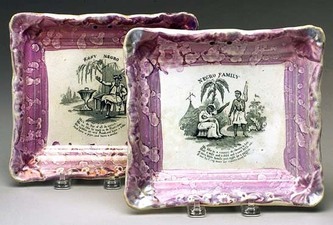 These plaques are smaller than the Moore & Co plaques with similar scalloped corners. 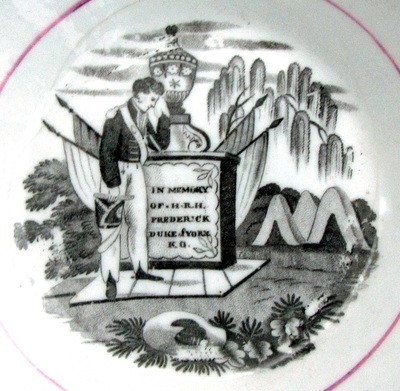 On the transfer from the plaque (centre and left) a British soldier stands next to a tomb with the inscription 'OBSEQUIES JAN 20 1827'. 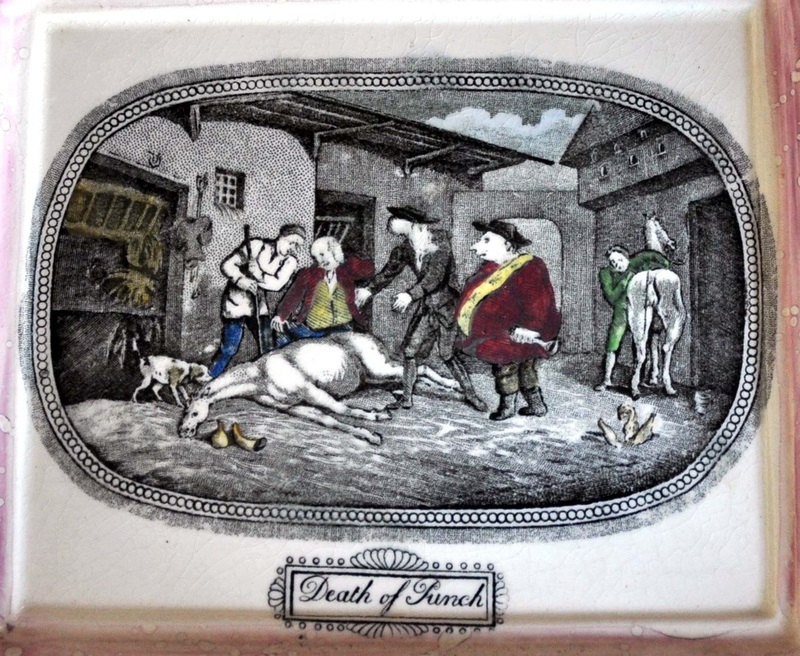 Obsequies means funeral rites. 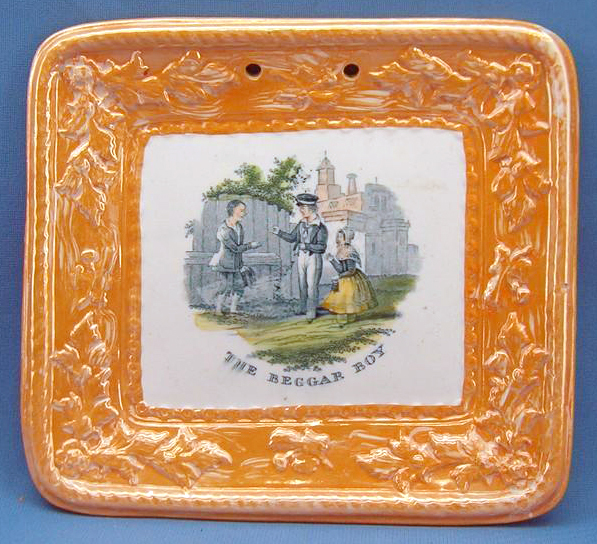 On January 20th, 1827, Prince Frederick, Duke of York and Albany, was buried in St Georges Chapel, Windsor. 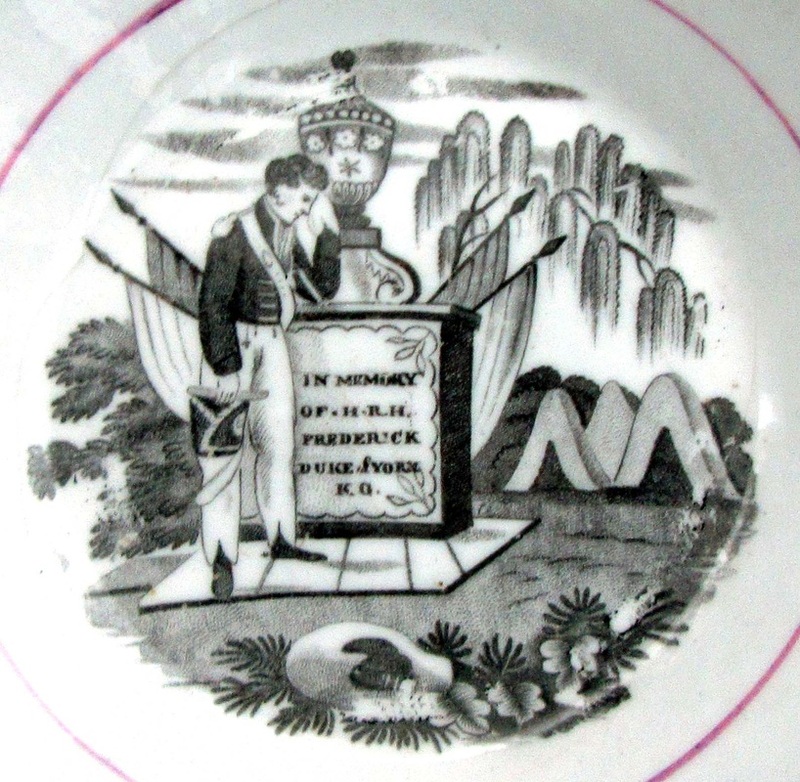 He was commander-in-chief of the British army, 'brilliantly reorganising his nation's forces, putting in place administrative reforms which enabled the British to defeat Napoleon'. 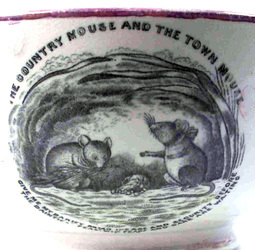 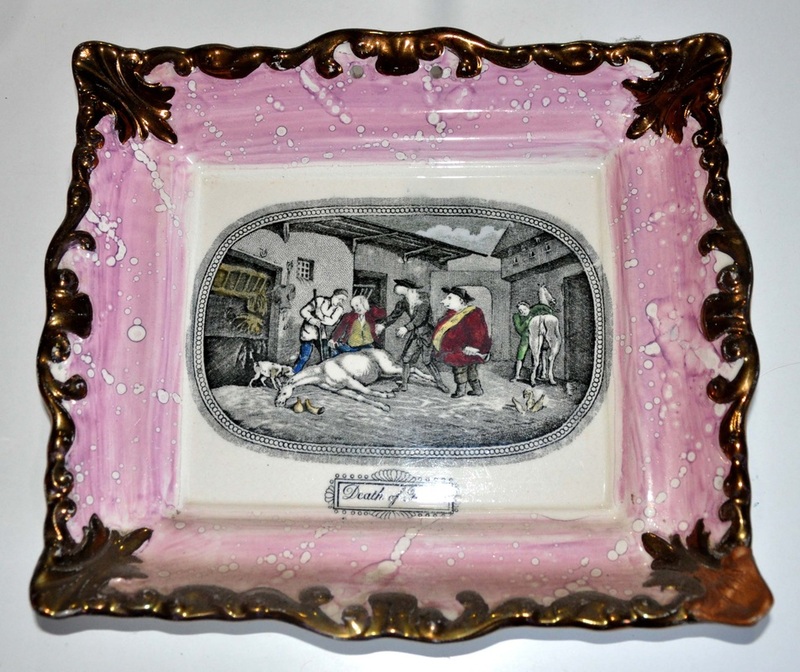 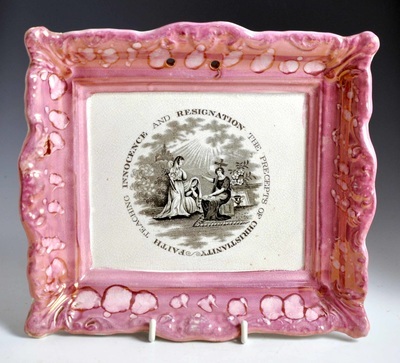 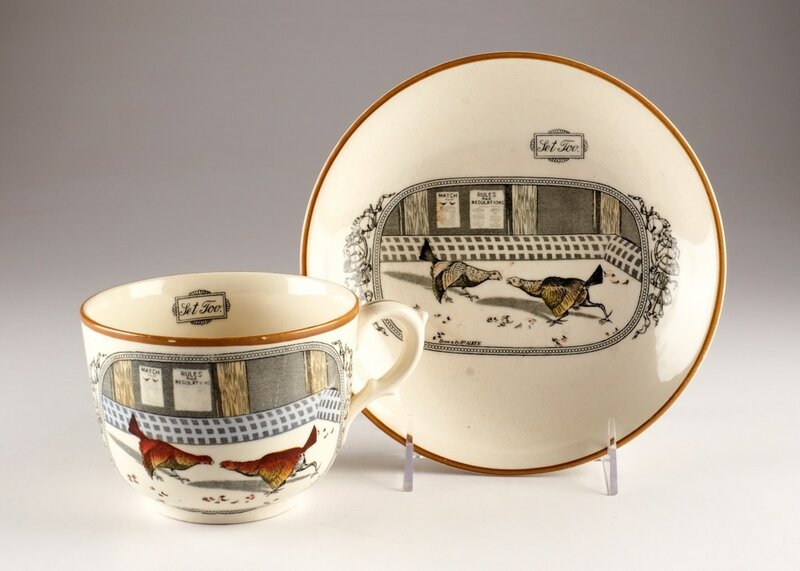 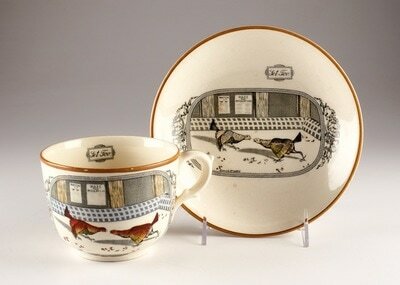 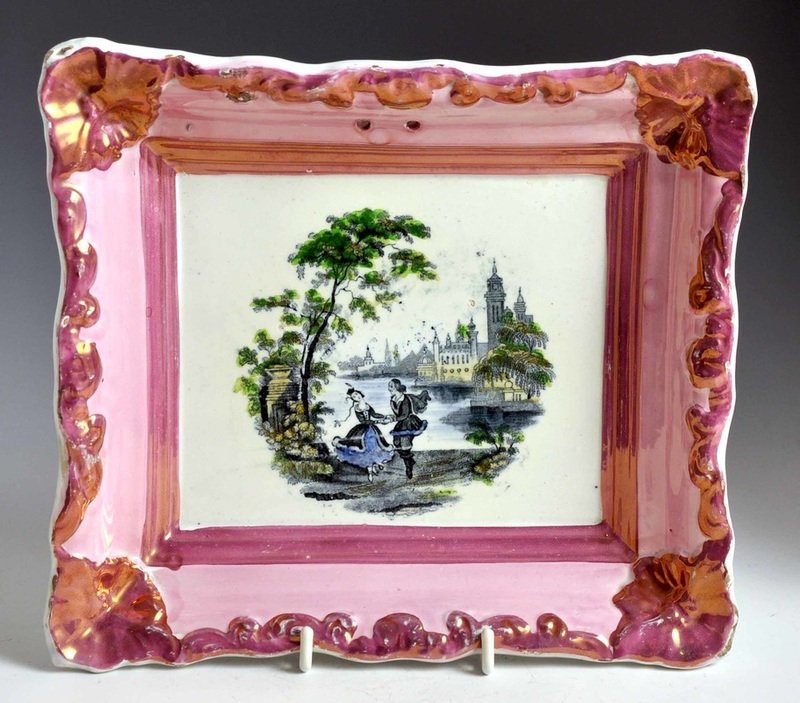 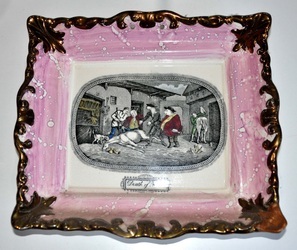 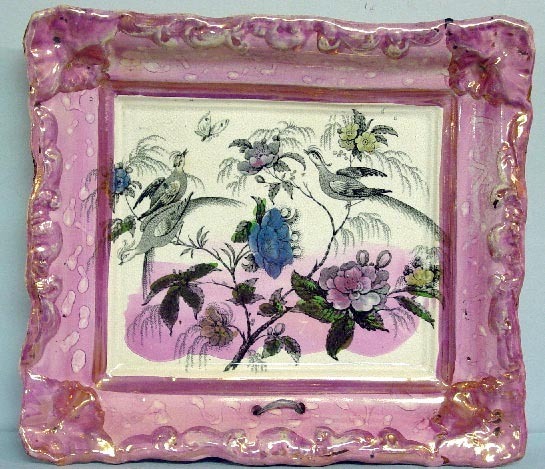 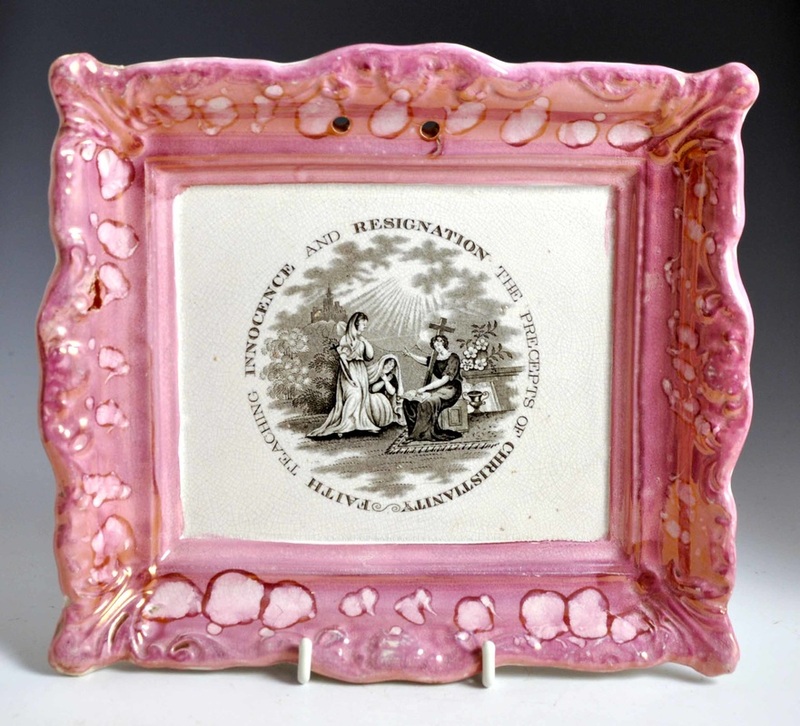 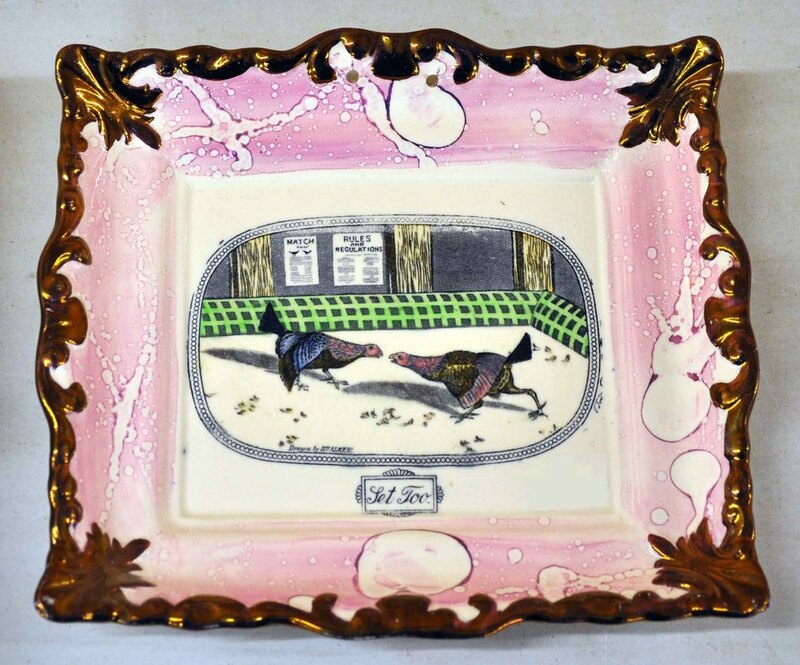 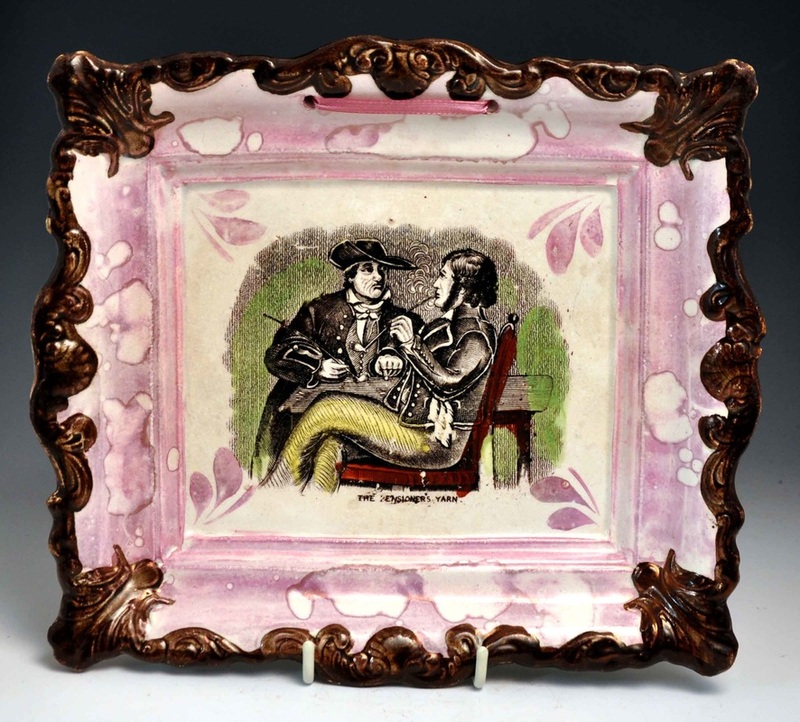 The similar transfer on the right, with Frederick's name, is from a pink lustre bowl – part of a tea service. 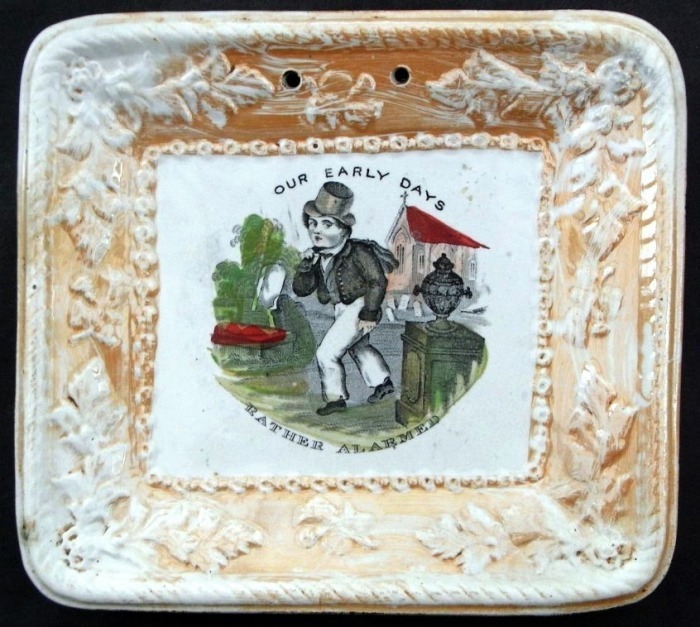 A series titled 'OUR EARLY DAYS'. The texts below the transfer read: top left, 'RATHER ALARMED'; top centre, 'NOW I'M GRANDFATHER'; top right, 'A HALF HOLIDAY'; bottom left 'THE EXPERIMENTAL PHILOSOPHER'; bottom centre, 'TOO LATE FOR SCHOOL'; and bottom right, 'ANXIOUS MOMENTS'. Noel Riley writes in his excellent book 'Gifts for Good Children' (see references) that Our Early Days is 'the title of a large series of plates clearly produced by a number of different factories (which) has given us the name for a whole category of images in which children are simply behaving as children - not with their families, nor with toys, or at any particular sport or occupation, but at games of make-believe, mischief or sheer boisterousness.' 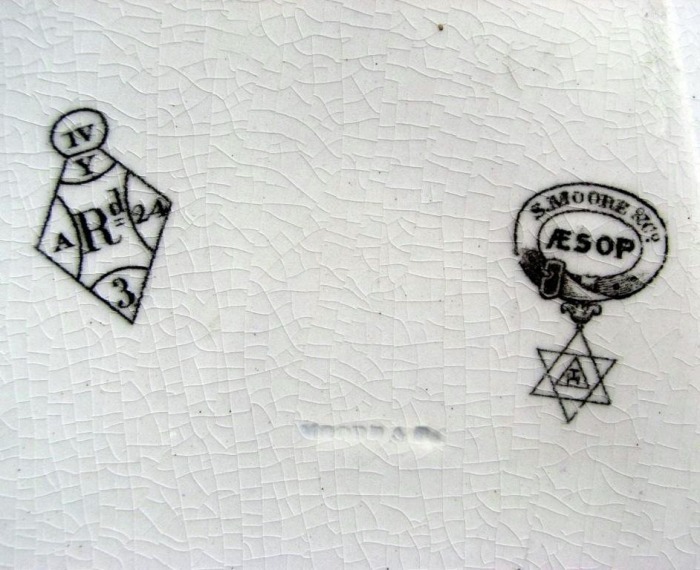 These transfers appear on wares with impressed marks from Moore's Wear Pottery and Scott's Southwick. 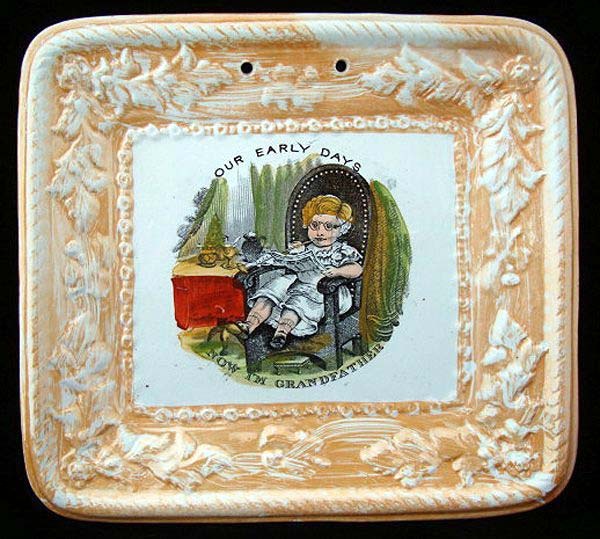 Titles which appear on plates, which I have yet to see on plaques include: 'Now I'm Grandmother'; 'The Romp'; 'The Pet'; and 'Keeping School'. 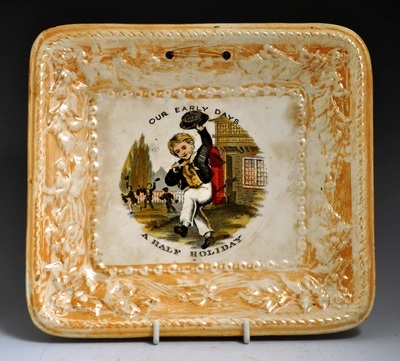 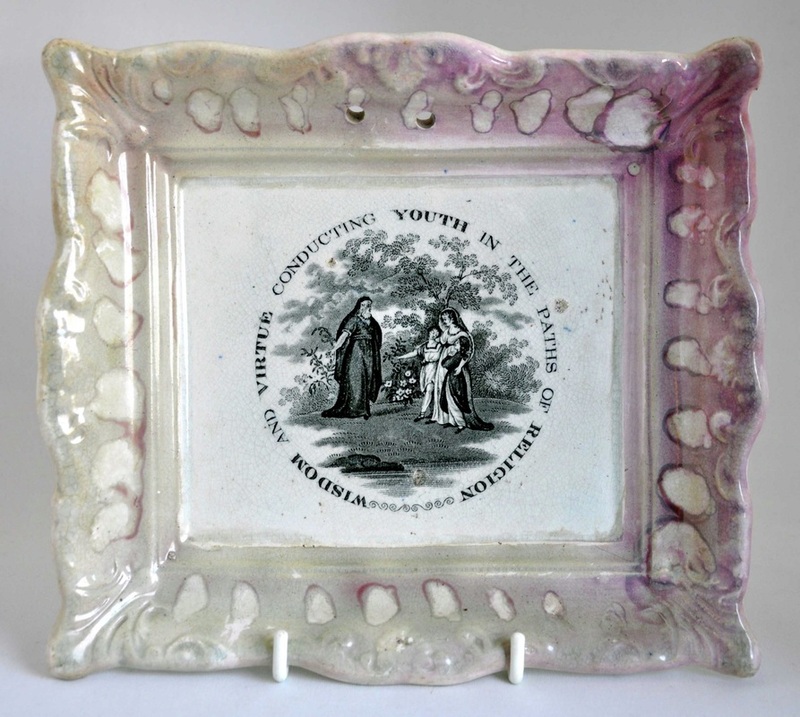 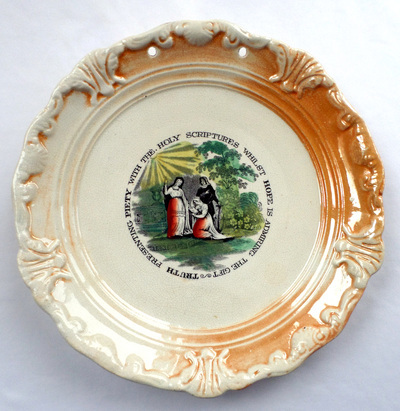 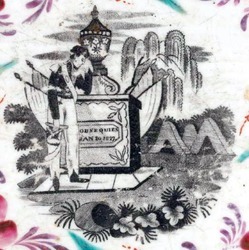 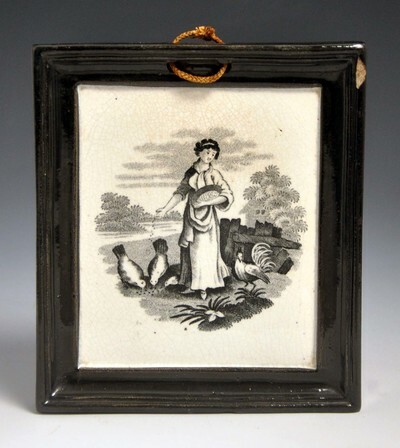 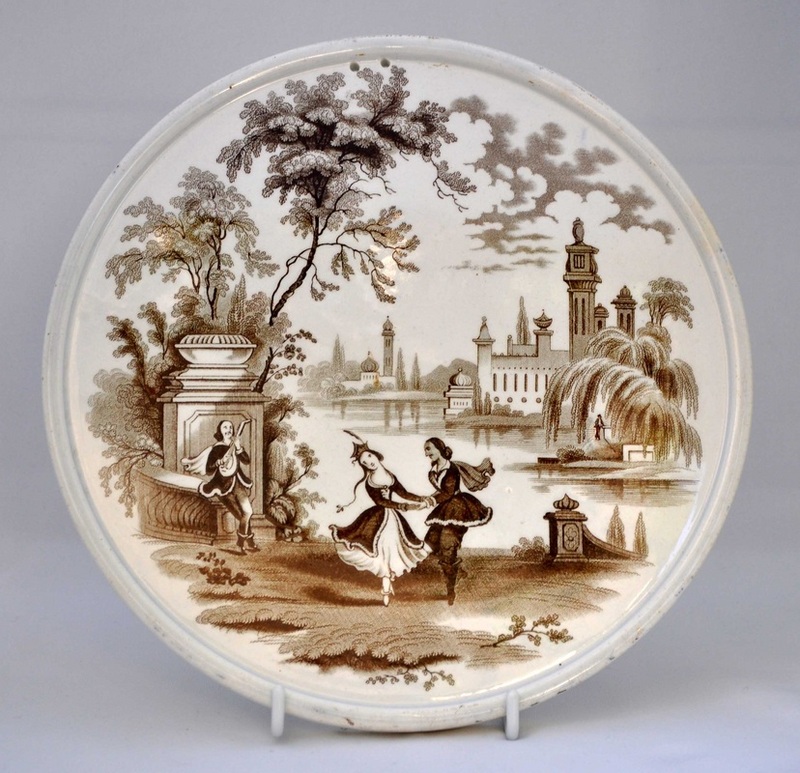 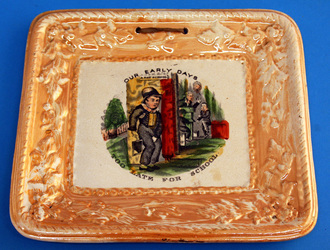 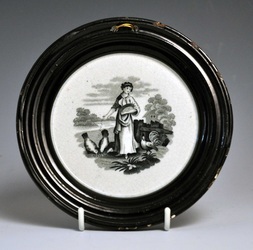 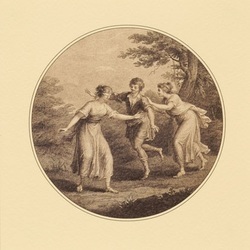 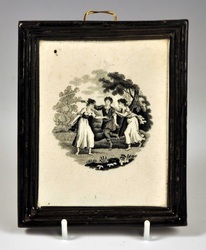 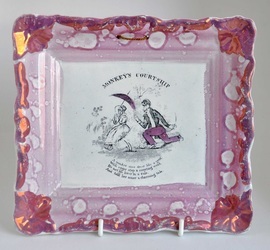 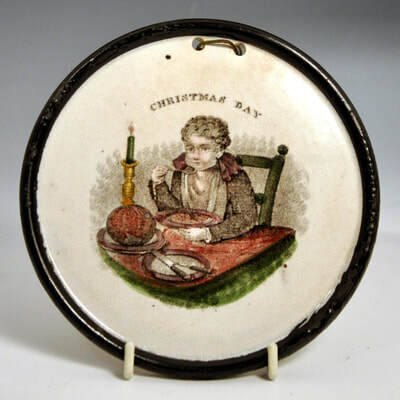 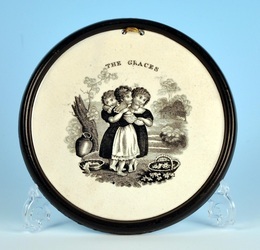 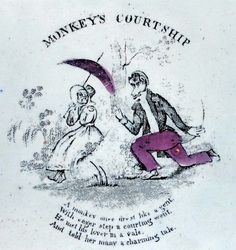 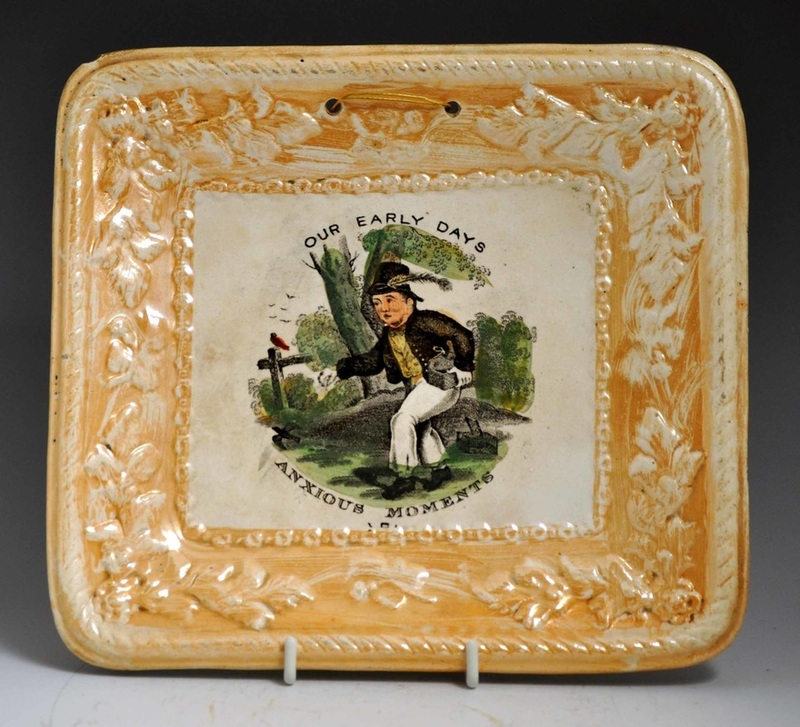 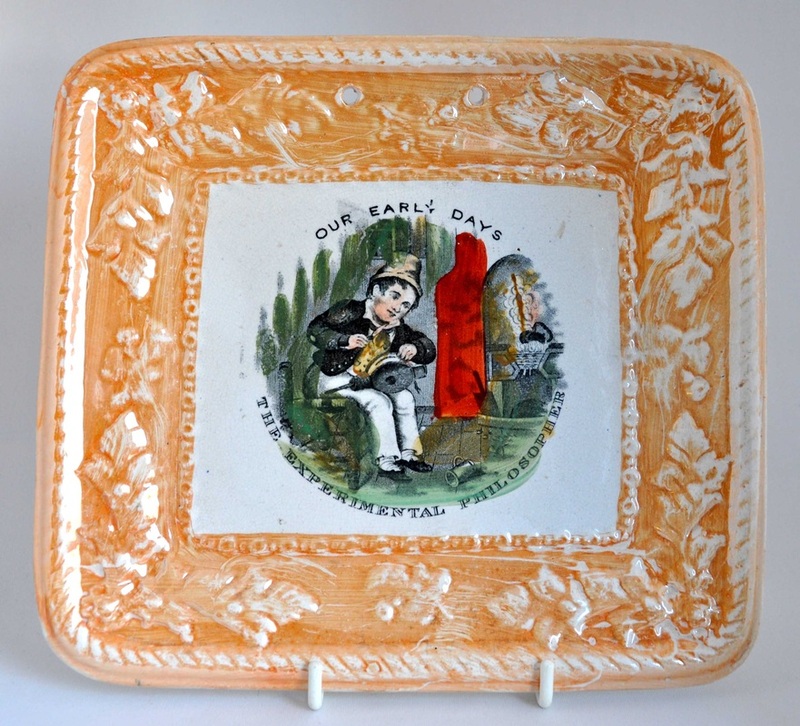 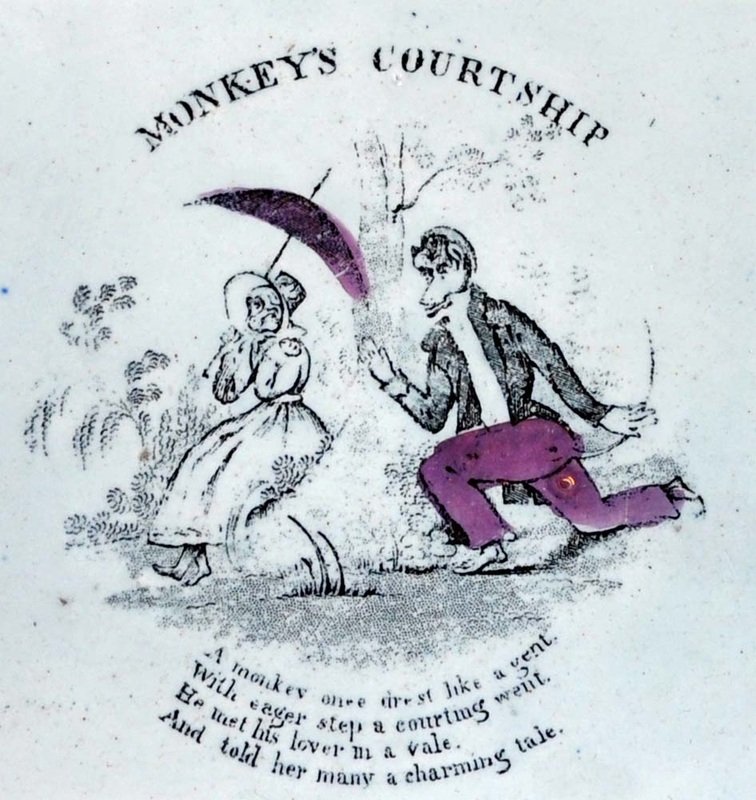 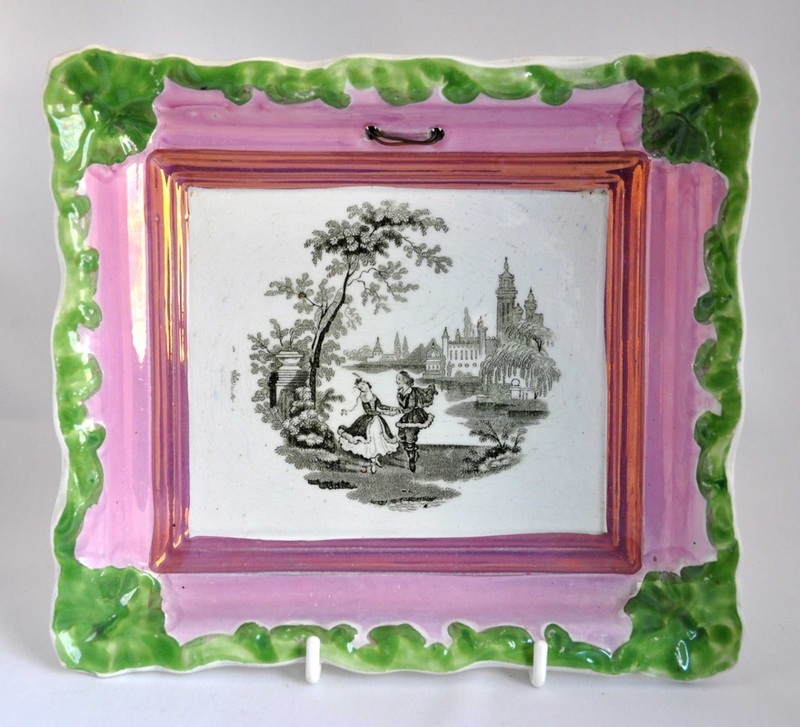 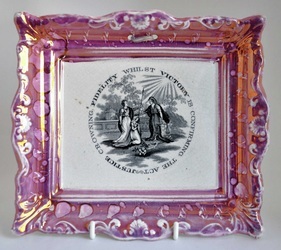 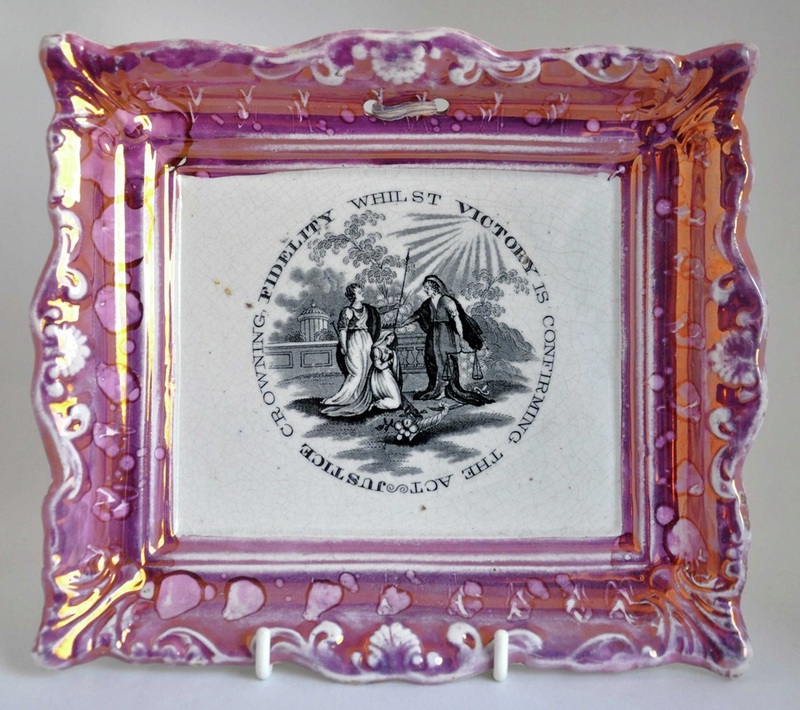 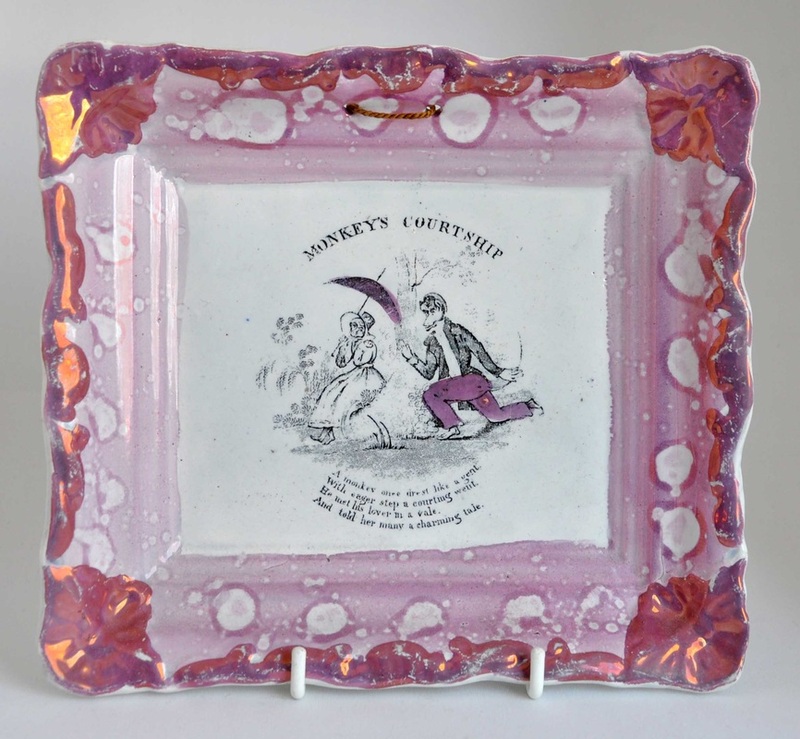 There is a similar series of transfers which appear on plates with the heading 'Frolics of Youth'. 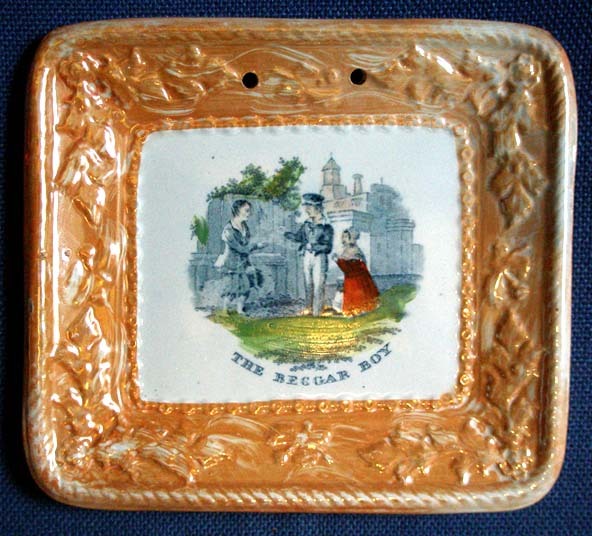 The first two plaques titled 'THE BEGGAR BOY'. 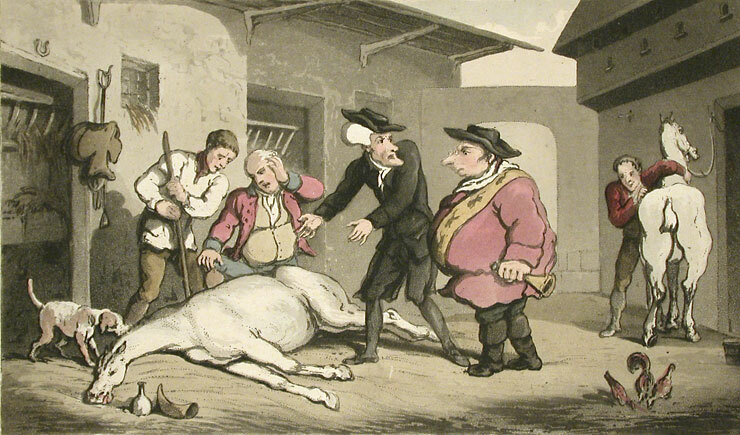 Top right: 'THE SICK DONKEY'. 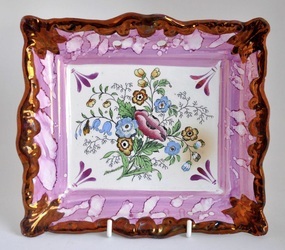 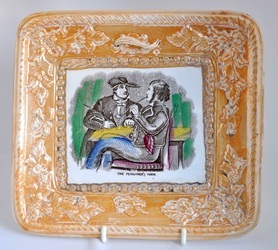 Ian Sharp says that he has a daisy plate with the identical transfer to the right plaque, with a SCOTT impressed mark. 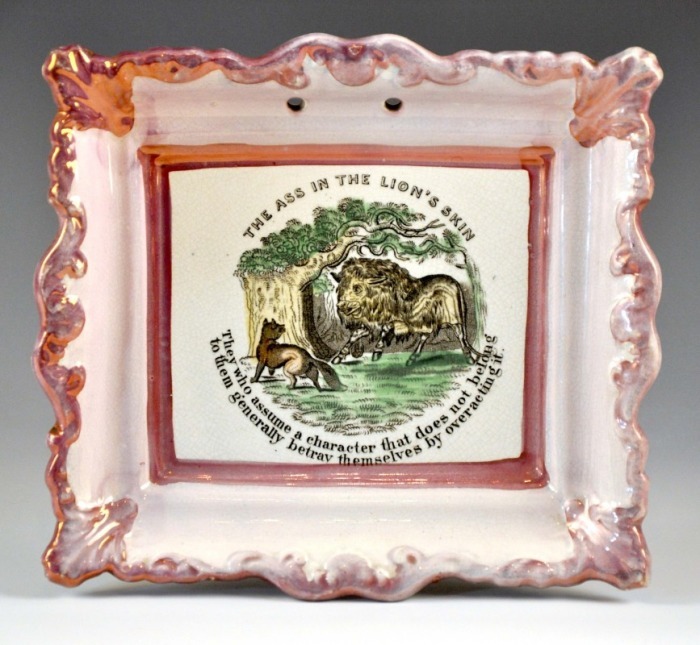 For similar plaques with animal subjects, see the Our Dumb Companions page. 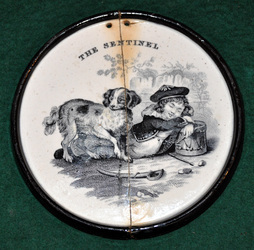 Although these plaque are unmarked, this transfer appears on other objects (bowls etc) marked both 'MOORE' and 'SCOTT'. 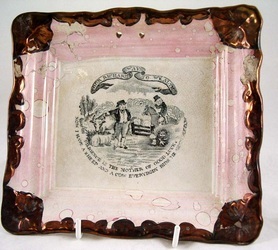 The first two plaques are attributed to Moore's, and the third plaque to Scott's. 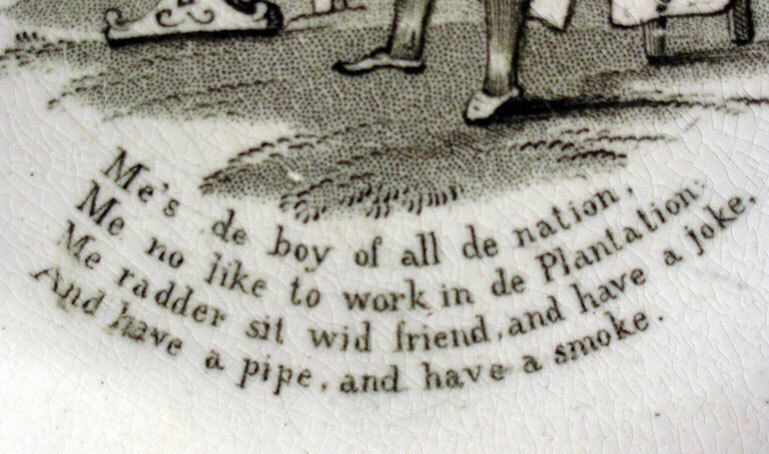 Baker talks of a Newbottle pottery 'Polka' jug (p44). 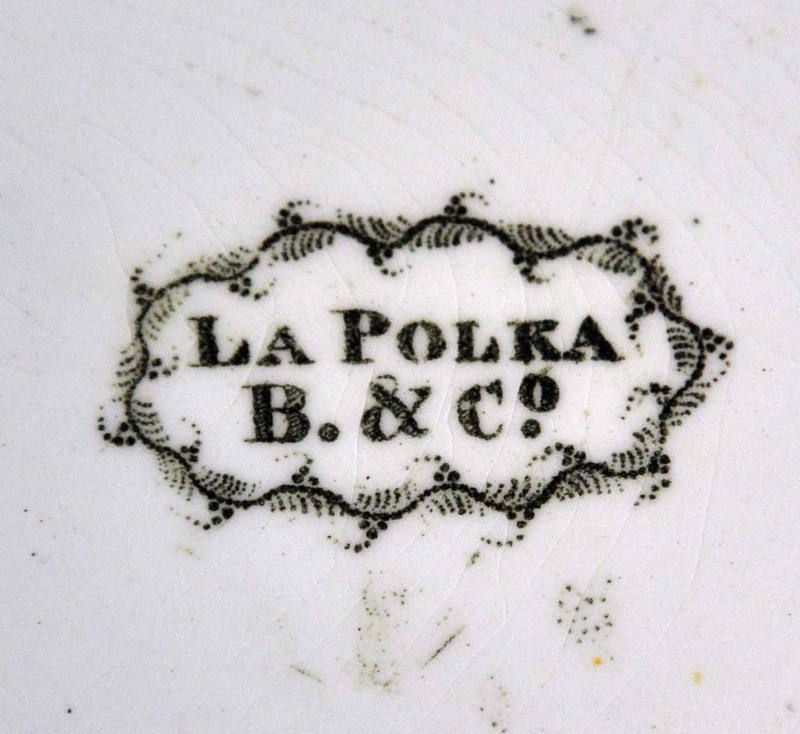 He says the Polka came into vogue around 1841. 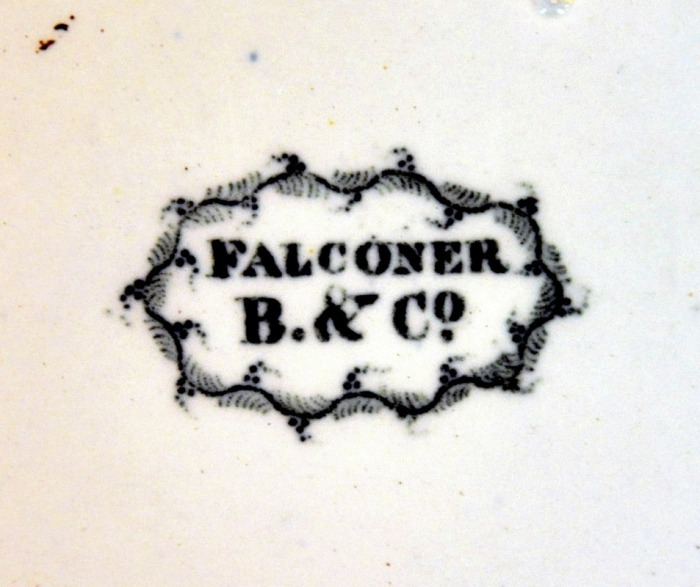 However, Ian Sharp has identified the first printed mark as the Tyneside company J Burn & Co from the Stepney Bank Pottery, Ouseburn, 1852–1860. 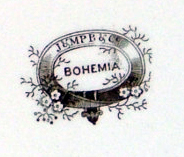 The third (circular – 9.25 inch diameter) plaque is later, and shows a variation of the La Polka transfer, but is titled 'Bohemia'. 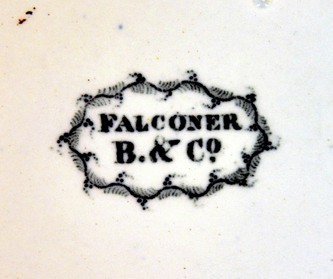 The mark is for the Glasgow pottery J & MP Bell & Co. Its similarity to the mark above is coincidental. 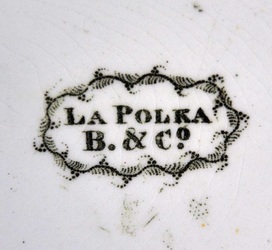 The first two with the backstamp 'ROBERT MALING' (1830–1840). 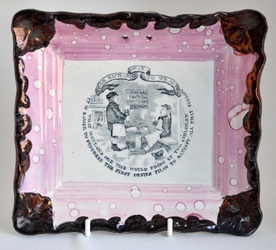 For two other Robert Maling plaques, see the Maritime verses page. Top left: 'FAITH TEACHING INNOCENCE AND RESIGNATION THE PRECEPTS OF CHRISTIANITY'. Top centre and right: 'WISDOM AND VIRTUE CONDUCTING YOUTH IN THE PATHS OF RELIGION'. 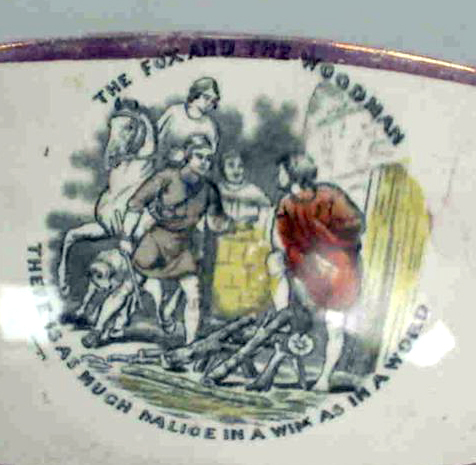 Below left: 'JUSTICE CROWNING FIDELITY WHILST VICTORY IS CONFIRMING THE ACT'. 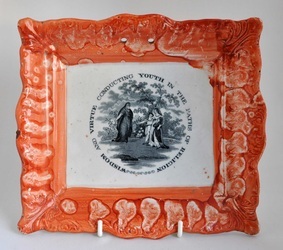 Below centre and right: 'TRUTH PRESENTING PIETY WITH THE HOLY SCRIPTURES WHILST HOPE IS ADMIRING THE GIFT'. These plaques are attributed to John Carr. 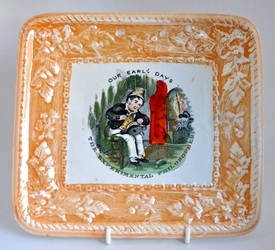 The orange glaze on the top right plaque looks and feels wrong, as if someone has attempted to over-paint it.